Okay, so the holidays are over, or sadly your trip to Italy (yum, Italy!). And the scale tells you that you’ve put way more effort into eating than exercising. What to do? Certainly, many of us try to lose the extra pounds by exercising more or perhaps by trying out new workout regimens. And that is when we learn that the adage “no good deed goes unpunished” can sometimes be true! Say Hello to the New Workout Craze: Higher Intensity Intervals! Also, Say Hello to New Tendon Pain! There’s a new exercise trend that incorporates higher intensity intervals while running or walking. These workouts have popped up everywhere from classes at Orange Theory to popular workout blogs to what seems like every magazine except Architectural Digest. This trend involves running or walking at different speeds while incorporating varying inclines. While these workouts can be effective and fun, unfortunately, they’ve led to more patients presenting to our office complaining of pain in their feet and ankles. One of the most common issues we’re seeing in these folks is pain at the posterior tibialis tendon which is a tendon that runs behind the inside prominent ankle bone (called the medial malleolus) and which serves a key role in supporting your arch. Interval training, when approached in the wrong way, can strain the tendon, causing it to become painful and inflamed. Here’s why. During an interval workout, as you increase your speed and incline, your body has a natural tendency to lean forward and thus change your center of gravity. This shift requires your knees and ankles to increase their range of motion. If your joints cannot compensate in this way, this will result in increased loading of your foot’s arch, which will eventually begin to collapse (this is known as pronation). Over time, the increased arch pressure can strain the posterior tibialis tendon, since it provides the main arch support. If this continues, you’ll develop pain and inflammation along the tendon’s trajectory behind the inner ankle (a condition known as tendinitis). The increased load on your arch can also cause a strain in the ligaments supporting the arch, the most important of which is the spring ligament. If this becomes torn, watch out, as it can lead to the development of a flat foot. Painful AND unsightly! As if that weren’t bad enough, constantly applying abnormal forces to the inner arch can also cause the Achilles tendon to shorten and shift slightly toward the outer foot. This results in reduced ankle motion that the foot compensates for by rolling into the arch with every foot strike. 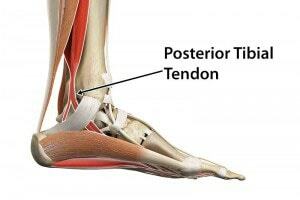 And then, you guessed it, posterior tibialis tendon pain! If all of this sounds like the old song… “the shin bone’s connected to the knee bone, and the knee bone’s connected to the…” it’s because our body is, in fact, finely balanced and designed to compensate when things get out of whack. So when one component of our foot and ankle is thrown off, it can result in a cascade of mechanical problems as the body tries to restore balance and function. Another important aspect of working out is what’s on your feet. We can’t stress enough the importance of wearing high-quality supportive shoes! Soft flimsy shoes do nothing to support your arch, so when you look for a shoe, you DO NOT want a shoe that you can twist and bend easily with your hands. Consider that your shoe must support your arch which you load with three times your body weight while running! Soft and flimsy doesn’t cut it. Since I am a Doctor of Podiatry, you might not be surprised to hear that I strongly recommend not just high-quality supportive shoes but also orthotics inside those shoes. And while custom orthotics are the best choice, even over-the-counter orthotics are better than wearing no orthotics at all. Why orthotics? Simply put, orthotics can help keep the foot from rolling in (known as pronation) causing the collapse of the arch. Orthotics also protect your feet by giving them additionally needed support and by keeping them properly aligned in the shoe. It’s important to note that, for best results, your foot needs to get used to wearing your orthotics before you transition to using them for more strenuous activities. My tendon pain isn’t improving or it’s getting worse. Now what? If you’re experiencing moderate to severe tendon pain that is worsening or accompanied by swelling at the inner ankle, it might be a good time to see a foot and ankle specialist. Depending on your situation, your doctor might recommend temporary immobilization in a walking boot. This can help calm down inflammation and give the foot the necessary rest and support it needs to recover. If your pain is not as severe, or if your pain and inflammation have decreased after a brief period of immobilization, you might be fitted with a supportive ankle brace. So what’s a weekend warrior to do to protect their tendon health? As you’ve likely heard countless times from professional trainers, after performing any exercise (including interval training) it is very important to stretch in order to avoid injuries. Unfortunately, most folks don’t follow this advice and this can lead to them having avoidable foot and ankle injuries. And while we love the company, we don’t like to see people suffering unnecessarily. If you are starting a new exercise routine, and you can afford it, you should consider starting out with a qualified trainer who will teach you the proper form that will reduce your chances of injury. If you work out in a studio, then inform the instructor that you are new to a class and provide him/her with a quick rundown of any significant physical issues or injuries so that he/she can watch your form and correct you when needed. Patients are our number one priority. Beginning with the ease of making your appointment, our family-friendly office staff is with you every step of the way. 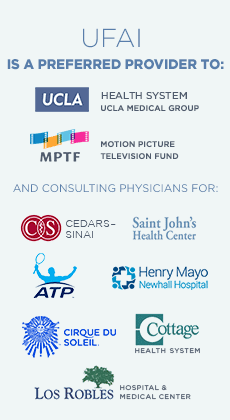 While most orthopedic surgeons focus on all the bones and joints in the body, only spending a fraction of their time on the foot and ankle, UFAI’s foot and ankle specialists exclusively chose to treat foot and ankle conditions as their lifework. Podiatric foot and ankle surgeons concentrate exclusively on the foot and ankle from day one of medical school. After medical training, they begin a rigorous three-year surgical residency. What sets podiatric surgical residents apart from general orthopedic residents is they specialize on the foot and ankle while most (though not all) ortho residents do not. Years of training and decades of experience and research is why the foot and ankle specialists at UFAI have the highest success rates in the United States. We have literally helped tens of thousands get back on their feet and back to their life. Dugan SA, Bhat KP. Biomechanics and analysis of running gait. Phys Med Rehabil Clin N Am. 16(2005)603-621. After completing high school, Dr. Allen attended the University of Arizona, well-known for its stellar athletic programs. In addition to playing on the Division I Woman’s volleyball team, Dr. Allen was a member of the Chi Omega sorority, where she helped raise donations for the Make-A-Wish Foundation. After graduating with honors from Kent State University College of Podiatry Medicine, Dr. Allen completed her residency at Cambridge Health Alliance, which is affiliated with Harvard University. During residency, she performed and researched different arthroscopy techniques to address osteochondral lesions. These days, Dr. Allen enjoys running, hiking and plays pickup volleyball games on the beach in Santa Monica where she currently lives. Previous: If You’re Suffering With Foot and Heel Pain, Don’t Ignore It.